Happy Wednesday to you all! I hope that your week is going well. Me? I'm sleepy, but good. I'm certain many of you are in the same boat (Cindy - prayers coming your way, girl! ;-)). One of my tasks this week was to attend a meeting of my parish's Worship Committee (details are in tomorrow's video post). And the main topic of conversation was planning for Advent. Is there anything more enjoyable than Advent planning for Catholic nerds? I think not. We got down with the liturgical Advent talk, but it got me to thinking about my own personal Advent plans. Magnificat Advent Companion, check. Various and sundry Advent wreaths and calendars, had those since the summer. AND I also have this delightful new chaplet of sorts, that coincides perfectly with the Advent season. And what would that be, you reasonably ask? 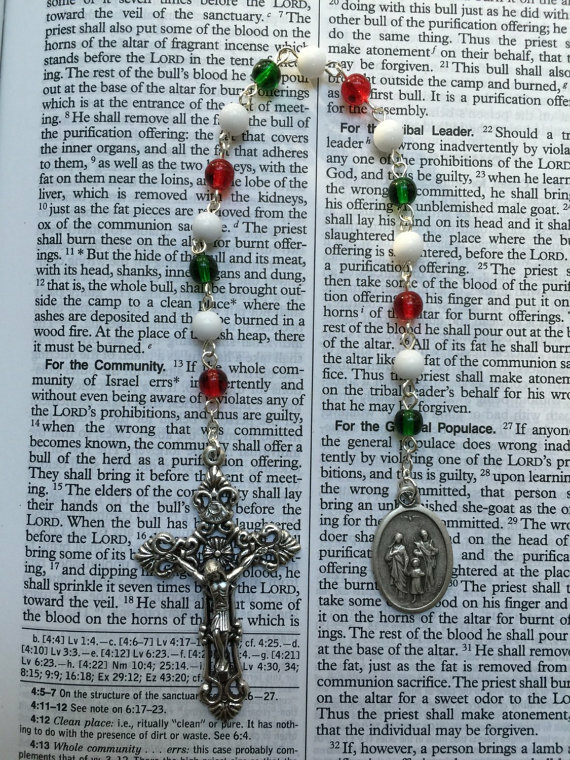 It is a set of beads designed to assist in praying the St. Andrew Christmas Novena. I had not heard of this until very recently. I have prayed a traditional Christmas novena before, which includes prayers for the nine days leading up to Christmas day. This is different. And although it's called a novena, it is not in the usual nine day format. This is a short prayer that one prays each day from the feast of St. Andrew on November 30th, through Christmas Eve. So, it's using the term "novena" to indicate a designated stretch of time, rather than nine day segments. Hail and blessed be the hour and moment in which the Son of God was born of the most pure Virgin Mary, at midnight, in Bethlehem, in piercing cold. In that hour, vouchsafe, O my God, to hear my prayer and grant my desires, though the merits of Our Savior Jesus Christ, and of His Blessed Mother Amen. This novena is also different from others in that instead of praying the prayer once per day, traditionally you pray it 15 times over the course of the day. So, you could choose to intersperse the prayer throughout your day, to keep your mind continually focused on the season, or pray them at the same time for one intensive stretch of prayer. 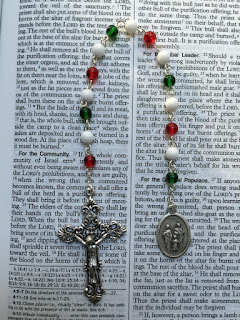 To aid in keeping track, my best rosary gal pal Allison designed the chaplet that you see in the photo above. I own aforementioned chaplet, and you can get one too if you like. :) The chaplet is ideal for praying the prayer all at once, but you could also use a small clip or zipper pull to attach to the loops and keep track of where you are if you prefer to pray periodically throughout the day. I like the thought of using this prayer during the Advent season to keep my attention focused on a contemplation of the nativity. I plan on praying it throughout Advent this year! More information on the St. Andrew Christmas novena can be found here.